Christina Elias is a freshman from Kansas City majoring in Journalism and Political Science, and is an assistant news editor and a design editor for The Pendulum. When she's not obsessively stalking news outlets on Twitter, she's usually trying to bribe someone to take her to Burger King. Between the 2015-2016 and 2017-2018 academic years, the numbers of Elon University’s non-white students studying abroad increased from 9 to 17.3 percent. Despite those gains, black participation went up less than 1 percent — from 3 to 3.3 percent of all undergraduates studying abroad — though from 2015 to 2018, the percentage of black students at Elon increased by more than 8 percent. The assistant director for the Center for Race, Ethnicity and Diversity Education (CREDE), Bell, knew that the event was celebrated annually at Elon University, a similar trend for the majority of college campuses. But Bell wanted to be different in honoring the civil rights icon. When he sat down to think, the question Bell wanted answered was how Elon would do the greatest amount of service involving the most amount of people. When students return to Elon University in the fall, there will be a new way to find a ride to Harris Teeter. The Better Alamance Timebank — a way for students and community members alike to acquire hours that act as currency through service — will officially launch May 9. When Iliana Brodsky woke up on the day of the most important auditions of her high school career, her voice was gone. For artist-slash-journalist Molly Crabapple, art has given her a voice in a world overloaded with messages from all directions. When money and college campuses are mentioned in the same breath, often it’s in reference to the long-standing stereotype of the broke college student. During First Lady Michelle Obama’s rally for Democratic presidential nominee Hillary Clinton, Michelle Obama spoke about the importance of the 2016 presidential election and how key issues will unfold over the course of the next presidency. 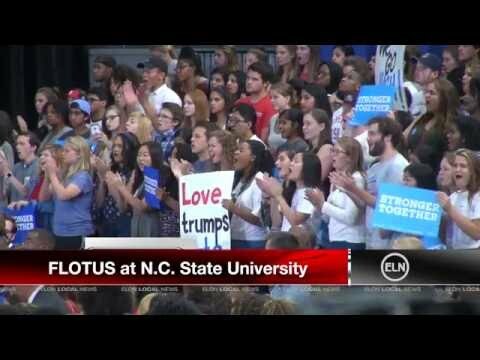 She regularly referenced the importance of voting and told attendees how to get involved as volunteers registered students before and after the event on the behalf of the Clinton campaign.. Obama spoke at Reynolds Coliseum at North Carolina State University at 3 p.m.
Elon University experienced backlash from students and families after sending a letter last fall explaining that because of School of Communications construction, seniors’ families would be limited to four Commencement tickets. The cost of a global engagement program is often a deciding factor in when, where and if a student is able to participate. When the year 2000 came around, Elon University officials drew up a plan for how they thought the university should focus on growing for the next 10 years. Elon University’s Global Education Center (GEC) announced the winners of its annual photo contest Monday, featuring student-submittedphotos of their Study Abroad or Study USA programs. Winners were selected from three different categories and won a variety of prizes. Even before the announcement of an expansion to the Love School of Business, students complained about parking. Now that construction is slotted to take place in the McMichael parking lot for the new building, there are concerns that student parking on campus will be even more scarce. Lynn Huber, associate professor of religious studies and chair of the Department of Religious Studies, will be the new Honors Program director beginning fall 2017. She will succeed the current director, professor of anthropology Tom Mould, after shadowing him throughout the upcoming academic year. Mould will remain on staff as an anthropology professor. In its third year, Elon Day continued its upward trend of breaking the previous year’s record donations. This year, the university received 3,749 total gifts, an increase of more than 1,000 from 2015. Republican businessman Donald Trump delivered an unusually positive message during his rally Wednesday night in Fayetteville. But as he expressed his gratitude to those in the armed forces and said he loved Hispanics, angst and divide grew during and after the event. Former Secretary of State Hillary Clinton and Sen. Bernie Sanders (I-Vt.) faced off in the latest Democratic presidential debate Sunday night in Flint, Michigan, focusing largely on policy differences. “Do you know what it’s like to represent 1 billion people every day when you walk out of your house?” That was the start of an hour-and-a-half long performance by three Muslim women relaying their everyday experiences living in the United States. Elon University delayed operations and cancelled classes after 3 p.m. Monday after inclement weather Sunday night and early Monday morning. University operations did not stop completely, unlike other nearby universities. A new student-led Living Learning Community (LLC) called the Hall for Change will offer residents opportunities to discuss current events, raise awareness of social justice issues and participate in service. Freshman Amy Belfer was inspired to create a place for Elon University students to come together to learn more about what is happening on campus, in the local community and internationally. Belfer said she realized the university did not have a social justice house like other universities. Elon University panelists explained it is possible to avoid choosing between faith and science. The event, “Evolution and Religion: Does human evolution represent a threat to my faith?” offered community members a chance to ask how to bridge the gap between religious and scientific thoughts.